What's up Lightgliders! I'm Norman Snowflake Cook and as your official Party Mod for this week, I've got some exciting event details for you! We want to start this Labor Day holiday weekend off right with a Labor Day Celebration! So grab your calendar and write this down! We will all meet in Mission Control at 5:30pm EST/4:30pm CST. 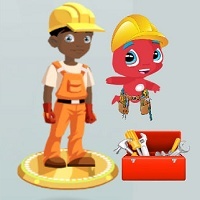 Starting this Wednesday, when you go into Glidebook, your Spark of the Day rewards will be the awesome Construction outfits! You'll have plenty of chances to get your costume in time to join the party! We'll start by meeting new Lightglider friends and if you stick around we will take a group picture to remember the day! Invite your friends and we will see you all on Friday! boo i missed it,... and how do you do the group picture thing?